London-based milliner BySju has teamed up with Oliver Proudlock of Serge DeNimes on a limited edition bowler hat line. Also known for his role in reality series Made In Chelsea, designer Proudlock worked in collaboration with the British brand to create the bold capsule collection, “utilising a mutual passion for the combining of contemporary design with traditional craftsmanship”. The unisex line comprises eight designs in a range of striking colourways, including royal blue, cobalt, burgundy, yellow and orange, as well as subtler shades of white and grey. Each piece is crafted from locally sourced materials, right down to the contrasting headbands being made from Welsh organic fair trade denim. Hat fans taken by the collaboration will have to move quickly to get their hands on a piece, as only 500 of the designs are being produced. See the exclusive collection campaign video and our Q&A about the range with Oliver Proudlock below. The BySju x Oliver Proudlock collection is available to pre-order online at sergedenimes.com and bysju.com now, and will be available at Topman and The Shop at Bluebird from July 13, priced at £95 each. FashionBeans: Where did the idea to collaborate with Sju on a collection of hats come from originally? Oliver Proudlock: I met Sju last year at a menswear exhibition at the Truman Brewery, I was there with my brand Serge DeNimes, and she was showcasing her bowler hats under her brand Bysju. I have always been massively into hats, and was drawn to her bold and colourful twist on the traditional British Bowler. Over the past few years, I have done a few collaborations under my own name Oliver Proudlock, and at that time I was seeking something within accessories. We got on really well, and as two young creatives with a similar goal, it didn’t take long before talks of a collaboration started. What’s the inspiration behind the hats, and why did you choose bowler hats specifically? When I was a young kid I used to raid my dad’s wardrobe, and I never forget when I found one of his bowler hats. They are so typically British, and have a strong link to my youth when I used to watch a lot of old movies. Everyone looks to fedoras now, but I think the bowler hat is more interesting. I particularly love this collaboration as we have taken something that is traditional and given it a contemporary twist, with the use of bright colourways and denim headbands, bringing something different to the market. 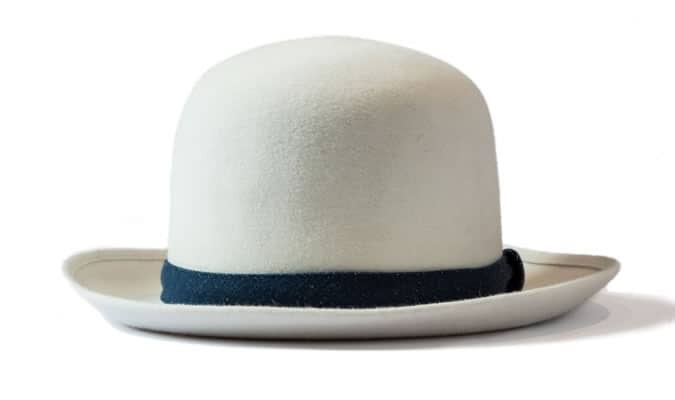 Is this a one-off collaboration, or are we going to see more Oliver Proudlock hats going forward? If so, what can we expect from the next collection? Sju and I have loved working together, and we are so happy with our first collection. As with all collaborations, I don’t just see it as a one off, I like to collaborate with brands and people that I believe in, and see it as an ongoing relationship. We haven’t talked about design ideas yet for the next collection, as we are solely focusing on making the noise now with these, but no doubt there will be variations in colour and material. How does the collection reflect on your personal style, and how much was the design influenced by your own wardrobe? I like to wear things that stand out, and are slightly unusual. I feel like this collection reflects this as we took a traditional product, and flipped it. We offer brighter colourways that will attract those who want to stand out, and are a bit more daring, as well as more subtle colours that are less risky. In terms of my own wardrobe, it is filled with a lot of hats and a lot of denim, so there is definitely a strong influence. As a designer, what inspires you? My inspiration is my immediate surroundings: the culturally diverse and volatile urban landscape that is London. I am just about to do an event with my brand Serge DeNimes showcasing our AW15 at the end of this month. We have teamed up with an amazing design agency called SFD, and we will be showcasing our biggest collection to date that will include jeans. I have also just started working with a very exciting online fashion platform called SHOPA. I am involved in their re-launch this year in the UK, New York and China. Finally, I’m in talks with a well-known glasses company in terms of collaboration. This is a product that is close to my heart, and I have wanted to work on for some time.